Scene from Whittier earthquake, October 1, 1987. Editor: Where were you during Easter Sunday’s earthquake? Patty and I were on the wooden deck and we felt every rock and roll, and went through four aftershocks. The following by Doug Copp will make you forget everything you’ve always learned about surviving earth quakes. My name is Doug Copp. I am the Rescue Chief and Disaster Manager of the American Rescue Team International (ARTI), the world’s most experienced rescue team. The information in this article will save lives in an earthquake. I was the United Nations expert in Disaster Mitigation for two years. I have worked at every major disaster in the world since 1985, except for simultaneous disasters. The first building I ever crawled inside of was a school in Mexico City during the 1985 earthquake. Every child was under its desk. Every child was crushed to the thickness of their bones. They could have survived by lying down next to their desks in the aisles. It was obscene, unnecessary and I wondered why the children were not in the aisles. I didn’t at the time know that the children were told to hide under something. Simply stated, when buildings collapse, the weight of the ceilings falling upon the objects or furniture inside crushes these objects, leaving a space or void next to them.. This space is what I call the “triangle of life”. The larger the object, the stronger, the less it will compact. The less the object compacts, the larger the void, the greater the probability that the person who is using this void for safety will not be injured. The next time you watch collapsed buildings, on television, count the “triangles” you see formed. They are everywhere. It is the most common shape, you will see, in a collapsed building. 1) Most everyone who simply “ducks and covers” WHEN BUILDINGS COLLAPSE are crushed to death.. People who get under objects, like desks or cars, are crushed. 2) Cats, dogs and babies often naturally curl up in the fetal position. You should too in an earthquake… It is a natural safety/survival instinct. You can survive in a smaller void. Get next to an object, next to a sofa, next to a large bulky object that will compress slightly but leave a void next to it. 5) If an earthquake happens and you cannot easily escape by getting out the door or window, then lie down and curl up in the fetal position next to a sofa, or large chair. 6) Most everyone who gets under a doorway when buildings collapse is killed. How? If you stand under a doorway and the doorjamb falls forward or backward you will be crushed by the ceiling above. If the door jam falls sideways you will be cut in half by the doorway. In either case, you will be killed! 7) Never go to the stairs. The stairs have a different “moment of frequency” (they swing separately from the main part of the building). The stairs and remainder of the building continuously bump into each other until structural failure of the stairs takes place. The people who get on stairs before they fail are chopped up by the stair treads – horribly mutilated. Even if the building doesn’t collapse, stay away from the stairs. The stairs are a likely part of the building to be damaged. Even if the stairs are not collapsed by the earthquake, they may collapse later when overloaded by fleeing people. They should always be checked for safety, even when the rest of the building is not damaged. 8 ) Get Near the Outer Walls Of Buildings Or Outside Of Them If Possible – It is much better to be near the outside of the building rather than the interior. The farther inside you are from the outside perimeter of the building the greater the probability that your escape route will be blocked. 9) People inside of their vehicles are crushed when the road above falls in an earthquake and crushes their vehicles; which is exactly what happened with the slabs between the decks of the Nimitz Freeway… The victims of the San Francisco earthquake all stayed inside of their vehicles. They were all killed. They could have easily survived by getting out and sitting or lying next to their vehicles. Everyone killed would have survived if they had been able to get out of their cars and sit or lie next to them. All the crushed cars had voids 3 feet high next to them, except for the cars that had columns fall directly across them. Spread the word and save someone’s life… The Entire world is experiencing natural calamities so be prepared! In 1996 we made a film, which proved my survival methodology to be correct. The Turkish Federal Government, City of Istanbul , University of Istanbul Case Productions and ARTI cooperated to film this practical, scientific test. We collapsed a school and a home with 20 mannequins inside. Ten mannequins did “duck and cover,” and ten mannequins I used in my “triangle of life” survival method. After the simulated earthquake collapse we crawled through the rubble and entered the building to film and document the results. The film, in which I practiced my survival techniques under directly observable, scientific conditions, relevant to building collapse, showed there would have been zero percent survival for those doing duck and cover. Hiding under my school desk will still protect me from nuclear fallout, though, right? Brian, it sure will, and BTW I have a bridge to sell you. Ah, some friends and I were debating this very subject last night. Good to get some clarification: forget the doorways, forget duck and cover, it’s all about the triangle of life. Hmm, Copp’s advice maybe not so good after all. I did a quick check of Snopes [ http://www.snopes.com/inboxer/household/triangle.asp ]and discovered that Copp’s advice is somewhat controversial. The Southern California Earthquake Center has a detailed response to his article [ http://earthquakecountry.info/dropcoverholdon/ ], the American Red Cross disputes his findings [ http://www2.bpaonline.org/Emergencyprep/arc-on-doug-copp.html ] and CERT-LA also has a rejoinder [ http://www.cert-la.com/RejoinderToDougCopp.pdf ]. After reading the various sources, I’m inclined to go with the SCEC and the Red Cross. Thanks for providing the imporant counter opinins. Shouldn’t someone do some journalistic fact checking before the publication of something as important as a siesmic survival strategy? I’m sorry, I’m not ready to rush to endorse anything the Red Cross says. I read these, and the last one actually confirmed at least half of what Copp has to say about earthquake safety. So, getting next to large furniture is good advice, not going to the stairs is good too, and what he says about wooden buildings is proper also, for instance. So, it seems, after the other reports nibble at Copp’s credibility, they support much of what he has to say. Rak beat me to it. I’d posted this on Facebook, and a friend shared the snopes link (http://www.snopes.com/inboxer/household/triangle.asp). Sounds like good advice, but now I’m skeptical. Thanks to rak for the collection of reading materials. I haven’t checked out all of the pages yet, but what I have seen seems to convincingly refute Doug Copps, almost point by point. Apparently it’s still about getting under some cover and trying to protect yourself, particularly head and neck, from objects that might hit you as the quake shakes. PS: Who would have thought there would be this kind of drama in the earthquake safety community? Only in America. P.T. Barnum was right. And it is EVERY minute. is the City going to put up Earthquake signs next to the Tsunami signs? Cowering under or next to any of that cheap, flimsy IKEA funiture people have these days is probably just a KYAG, (kiss your a$$ goodbye), exercise anyway. Remember how impressed you were when that 8′ entertainment center was deliverd in one small box? Well that’s how big it’s going to be again when a wall falls on it. The guy comes across as a self promotor…..I asked several VERY good friends who ARE first responders about it……they called BS on his ideas. Time for a self test. How much emergency water did you have at home when the quake hit? How much in the trunk of your car? You don’t have to answer here publicly, but answer to yourself…truthfully. Could it be measured in tens of gallons, or mere pints of water. Water: check. Nonperishable food: check. Generator and fuel: check. Portable radio: check. Boxes of 9mm ammo: check. Reluctance to use firearms: none. I read years ago that this ‘triangle of life’ was nonsense. Look it up . 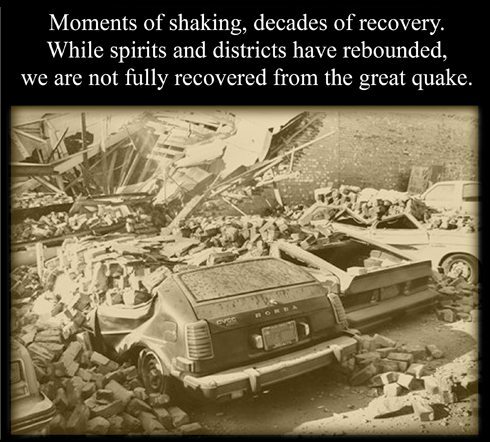 Years ago a good friend, a psychic, told me ‘ when the earthquake comes hold hands and dance’ . I’ve never had the chance to use the advice yet!